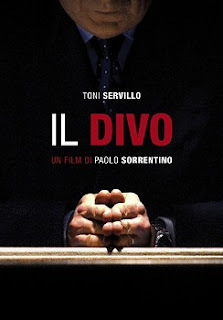 We caught the Italian film, Il Divo, about Giulio Andreotti at the Seattle International Film Festival (SIFF) last night. Andreotti is an Italian politician of the centrist Christian Democratic party who served as Prime Minister to Italy a number of times between 1972 and 1989. In 1991 he was name Senator for life. Andreotti is a controversial figure and if his nicknames are any clue (Beelzebub, Hunchback, the Black Pope, the Fox) he inspired and still inspires a lot of emotion. His party was ultimately brought down by corruption and Andreotti himself investigated, accused, convicted, and acquitted of ties to the Mafia. The movie takes place from 1992 until the start of his trial for collusion. The film (in Italian) with English subtitles is a biopic (with fictionalized episodes) is very stylized and surreal at times; don’t expect a dry biographical sketch here. A trailer for the film is here.